Halloween 2004 - The Halloween That Wasn't? Well, this year's halloween won't go down as the most memorable in the Day Family Scrapbook! Steven had been down with a virus for three days and started the day at 4:00 a.m. with a fever of nearly 104. 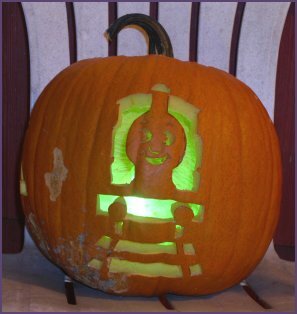 He was going to be Thomas the Tank Engine for Halloween but Thomas will have to wait for another day! Diana was a cat from the musical, "Cats" this year. 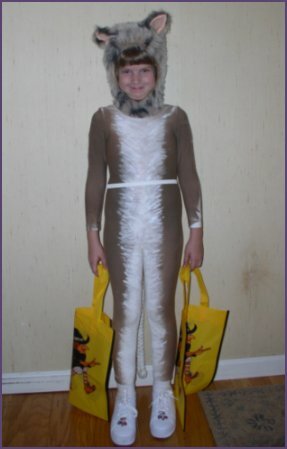 Grandma made the costume, complete with a handpainted leotard and a calico cat-colored head piece. Unfortunately, Diana wasn't in purr-fectly good spirits this evening, as she decided to forgo the theater cat face. Ah well... her own pretty face would be just fine! All was well until 15 minutes after Diana left to go trick-or-treating with Grandma. Diana had been recently spooked at a haunted house, and so a neighbor dressed in a scary costume put and end to her treat-seeking adventures. Oh well, better luck next year! John carved this pumpkin for Steven... and who else did he carve? Thomas! 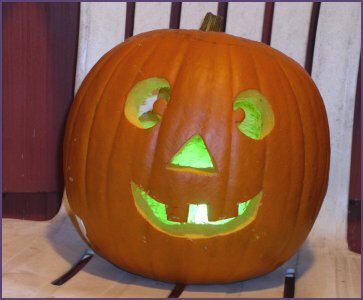 Diana's pumpkin became a traditional jack-o-lantern with silly eyes!